An open source instruction and plan set from the digital design model & files of this working 5 axis CNC machine. This set of instructions is to be extracted from the digital documents of a working 5 axis machine which I have just recently fabricated and is fully operational. CNC machines are valuable tools that can enable more expressive design to be realized at more competitive prices. Whether you are a product designer, an architect, a builder, a welder, fab shop, or just about anyone who makes things or wants to make things, CNC technology is for you. 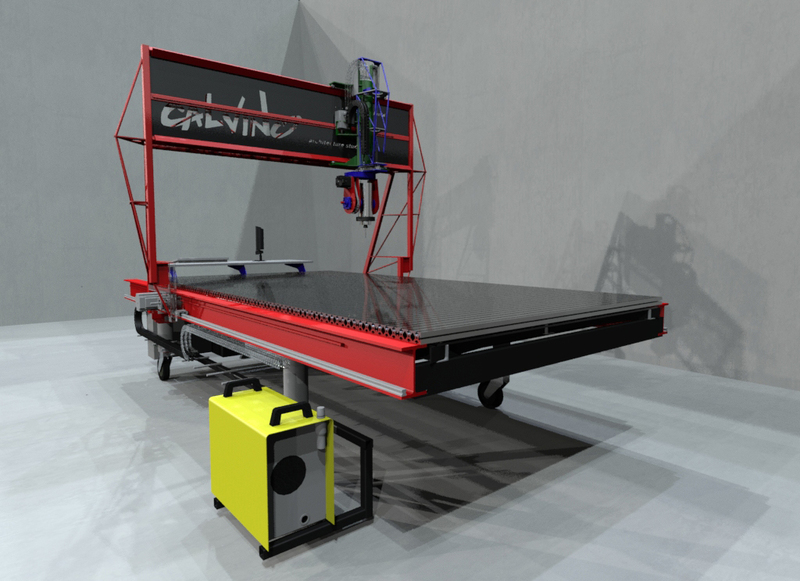 This 5 axis CNC router is 10' long, 5' wide and has a Z stroke of 24". This project is to produce a set of plans & instructions from which one can build a machine. The plan set will be released as an open source document set under a GPL3 license in an attempt to place the technology into a greater number of more creative hands. 3 axis CNC machines are becoming much more commonplace and are quite simple to build/fabricate. 5 axis machines however are a little more complex, although, you'll find that they are in fact not quite that much more complex.. The intent with this set of plans is to break down this 5 axis machine into a set of drawings, parts lists & 2d cut files, supplier lists, and a set of instructions. All of this is to be released open source so that one can take the concepts and modify them if one so chooses. As a matter of information, not all CNC CAM software can generate code for a 5 axis machine. Commercial CAM software for simultaneous 5 axis machines is very expensive. This is software which takes a digital model or drawing (3d model in the case of 5 axis) and turns it into a toolpath which the CNC machine can use to control the movement of itself to make your part. Simultaneous 5 axis CAM programs can run anywhere from $12,000 to $24,000. Some examples are MasterCam pro with Multiaxis ( http://www.mastercam.com/Products/Router/Default.aspx ) and RhinoNC ( http://rhinonc.com/index.php... ). However, there is at least one open source 5 axis CAM solution called the CNCtoolKit ( http://cnc-toolkit.com/ ) which is a plug-in for a popular 3d modeling program. I have a modified script version of the plug-in which works with the machine that will be described in the plan/instruction set. The modified script will be available with the plan set. Another solution for the CAM part of the 5 axis machining may become available as a Mathematician Edmund Harriss ( http://www.mathematicians.org.uk/eoh/ ) has tentative plans to create a Grasshopper (http://www.grasshopper3d.com/ ) - a plug-in for Rhino3d ( http://www.rhino3d.com ) - definition where one will be able to define a 5 axis toolpath about a 3d object and export simultaneous 5 axis g-code that the machine can utilize to machine parts. Edmund tentatively plans to have a working beta version by late spring 2011. Watch his website for more details about this. The money raised with Kickstarter will afford me the time to take the hundreds of photos, drawings, cad files, g-code files, etc., that were created to make the custom machine and edit them all into a readable, logical set of drawings, instructions, lists, and maybe even video. This will enable the release of a complete set of open source instructions on how to build a large, production quality, 5 axis CNC router/plasma machine. Some images of the backer rewards parts can be found here: http://www.calvinodesign.com/90037/90037-02.03-5axisCncPlans/. Most importantly, this set of instructions will show concepts about how a 5 axis CNC machine works and one solution to how it can be made. This will hopefully enable more minds to create machines utilizing the technology and enable us all to make things around us that are more expressive and more beautiful at more economical prices. 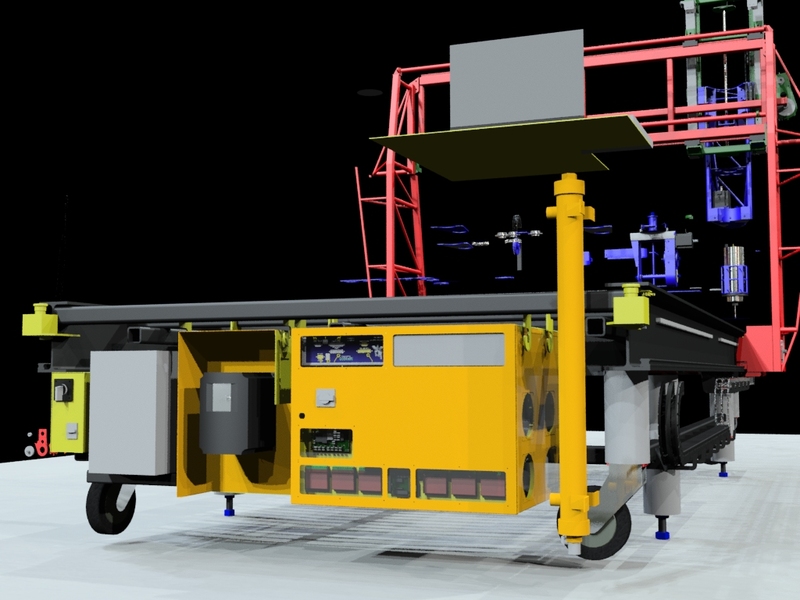 Once the funding goal is reached, it should take approximately four weeks to assemble all of the documents into a set of plans/instructions that will include 3D CAD models, some 2D CAD drawings and cut files, hyperlinks to suppliers, parts lists, and concept explanations. This set of documents will be available for download from www.calvinodesign.com. Thank you for your interest. Cheers! All of the download-able open source plan/instruction documents, PLUS your choice of: a 14ga. gantry shear plate with custom logo designed & plasma cut into it, OR one X motor bracket & pressure spring with timing gears, a belt, & the pinion gear, motor not included but bracket has holes for NEMA 23 & 34. Includes shipping to the contiguous 48 states, shipping outside of the contiguous 48 states will be additional cost to the backer. Same as above, PLUS an additional X motor bracket as described above (motor not included). Includes shipping to the contiguous 48 states, shipping outside of the contiguous 48 states will be additional cost to the backer. Same as above, PLUS the Y motor bracket as described above (motor not included). Includes shipping to the contiguous 48 states, shipping outside of the contiguous 48 states will be additional cost to the backer. All of the download-able open source plan/instruction documents, PLUS a 14ga. gantry shear plate with custom logo designed & plasma cut into it, PLUS THREE (two X + one Y) motor brackets & pressure springs with timing gears, belts, & the pinion gears, motors not included but the brackets have holes for NEMA 23 & 34. Includes shipping to the contiguous 48 states, shipping outside of the contiguous 48 states will be additional cost to the backer. All of the download-able open source plan/instruction documents. PLUS, THE BIG ISSUE: you get the complete A/C axis head with gears, belts & mount holes for your selection of spindle/router. Spindle/router and stepper motors not included. (Backer to supply make & model with dimensions & configuration of mounting & holes for spindle/router). A/C head is designed to be welded to a Z carriage fabricated per the open source documents. 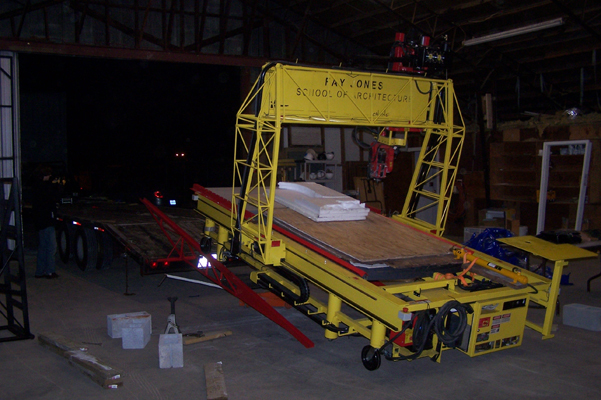 (welding or drilling & bracket fabrication required to attach it to your Z carriage). This A/C head design is intended for machining tolerances for construction industry and should be assumed to be +/- 0.125". Shipping to contiguous 48 states included, shipping outside of contiguous United States will be additional cost to the backer. All of the download-able open source plan/instruction documents, PLUS a 14ga. gantry shear plate with custom logo designed & plasma cut into it, PLUS THREE (two X + one Y) motor brackets & pressure springs with timing gears, belts, & the pinion gears, motors not included but the brackets have holes for NEMA 23 & 34. PLUS THE BIG ISSUE: you get the complete A/C axis head with gears & belts with mount holes for your selection of spindle/router. Spindle/router and stepper motors not included. (Backer to supply make & model with dimensions & configuration of mounting holes for spindle/router). This A/C head design is intended for machining tolerances for construction industry and should be assumed to be +/- 0.125". Shipping to contiguous 48 states included, shipping outside of contiguous United States will be additional cost to the backer.